School trips: signing up for one is like signing up a declaration of independence – one’s cares and responsibilities are momentarily swept away by the opportunity for exploration beyond the tedious realms of everyday life. School trips represent some kind of an outlet, a vent for one’s long-repressed desires which have consciously and unconsciously accumulated throughout the seemingly perpetual, dreary days of normal school existence. From this point of view, the trip that I experienced recently can safely be considered a true paradiso…. The last word there might have given it away, but about four months ago I found myself in Florence. Indeed, the ‘cradle’ of the Italian Renaissance offered me an escapade, a form of catharsis which somewhat enlightened me, purified me, purged (for at least a fleeting moment) some of my deep, internal inklings which had previously ailed me. Was it the painting, the sculpture, the architecture? One would be inclined to believe so but the answer lies elsewhere. Since I am not writing the script for a soap opera, I’ll swiftly delve into the actual substance of what this trip represents, what it signifies and what conclusions I have drawn from it. First of all, a key realisation that initialized this 4-day odyssey came early on, as I was half-sleeping on the coach that took us from Pisa to our desired destination - Florence. 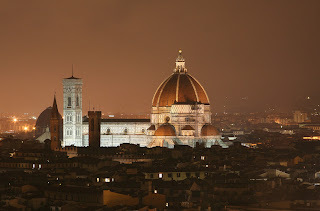 As I glanced at the nearing lights signalling our arrival at this labyrinthine city, I contemplated the twilight sky and the vista offered by the cupola of Florence’s central cathedral: the brilliantly-defined contours of the Duomo lined up against the cloudless bluishness of the dusky sky gave me a thrill, a sensation which amounted to hypnosis. This was not due to the excessive beauty of the scenery or the fresh Tuscan air, but quite the opposite in fact – it was the cosiness, the unpretentious simplicity of the mostly yellow and ochre painted houses that surrounded us. Such abstract thoughts were duelling within my mind and just like so many countless times before, the heart had already won this duel of sensations before the mind even got a chance to exclaim ‘en garde!’. But such abstract, unfittingly innocent Wordsworthian thoughts had no place here on this trip I was quick to recognise. The cardboard cutaways that were the people I was required to march along with were hardly appreciative of the beauty or history of the city. Indeed, they were not totally oblivious to it as I presupposed at first, but for instance, the exquisite statues that adorned the colonnade of the Uffizi gallery were virtually non-existent for them even though they represented the absolute genius of the city: sculptural portraits of Leonardo, Michelangelo, Raphael, Galileo, Dante, Machiavelli were merely the ticks within the itinerary drawn before-hand and no-one even ventured to take photographs with them - they simply passed them by without a gist of recognition, or even the merest, most casual glance. More to the point however, this actually led me onto the idea of what distinguishes the more mature, more mellifluously fine-tuned mind from the rather unripe, stubborn, as-green-as-chlorophyll consciousness of the average teenager: it is the ability to appreciate the symbolism behind physical beauty, preferring the substance found within rather than the elegant façade as was the case with those prepossessing statues outside the Uffizi. Sure, their charm is of course contained in their exquisite finish, but more importantly, they serve to depict certain figures of the past of immense historical value. Was I the only one who could appreciate that? Indeed, it was in my view an apt demonstration of where the two ends of the verdant and the ripe type of mind meet, for recognising the innerness, the ethereal symbolism of that which may initially lure you with its fine exterior, is no doubt, the art of appreciating art (even of you are blind-folded, or just blind). Upon seeing Michelangelo’s David in the Galleria Academia, one girl from our merry collegiate was evidently unimpressed, and denounced it as ‘just another sculpture’. Of course, it’s made from marble like most of the other sculptures, but then she failed to grasp the fact that its placement in the very heart of the gallery, is not at all coincidental, and what it represents, indeed, what it stands for, is of incommensurable significance because it is a true landmark of the world, and there’s no higher pedestal for it but that. Explaining all this to her would have been of no avail. Feel free of course, to accuse me of excessive self-acclaim with this observation, but just as I have the right to breathe, I have the right to insight! In that case, let the assertiveness of my ego be my oxygen! Moving on, the mostly Apollonian days of my trip were shamefully besmirched by the prevalently hot Dionysian nights. No, there weren’t any actual brawls (hence that ‘shamefully’ remark earlier) save for that of occasional quarrelling, but that was all merely the handy work of rose wine and my willingness to experiment. Either way, I decided to play the role of the jester - that agent provocateur disguised as Bacchus! My half-drunkenness however was still urging me on with forceful vehemence, and my seemingly entertained audience likewise undertook the suspicious effort of cheering me on, evidently stirring up more trouble for my already crippled pride. I kept my head high, chin domineeringly up, and eyes bulging and glittering like crystal balls, affronting the very basic principles of decorum and Florentine humanistic dignity. Along came my next pitiable performance as I recited Hamlet’s ‘to be or not to be speech’ in its entirety, hiccupping for obvious symbolical reasons and with ill-fated promptness at ‘proud man’s contumely’. Still, the aftershocks I was to experience later. Disregarding the charade I had caused, I stormed out of the room, and out onto the deserted, narrow road where our hotel was stationed. The bulk of my physical weight I felt in my head, as I began lingering around the area, where nightlife thankfully lacked the vibrancy of early 20th century Monmartre, thus serving to sober me up quite refreshingly. I eventually took sanctuary in a small restaurant, where I sat down by myself, with a level of confidence which only a person who has just experienced a sudden bout of shamelessness is capable of. The quietness and laid-back atmosphere of the place was appealing to me. I closed my eyes for a moment and reflected on the night’s happenings. Of course it would have all been forgotten by the morning, for the drinks would have taken care of this. Still, was it all necessary? Was the provocation I had witlessly masterminded really worth the indignity, and all for the sake of taking my chances only to see what would happen? One needs such experiences if only to atone later through the refined touch of imminent regret, which would later serve to exasperate the cerebral realm of our being. Better be alone in one piece than be desired in several, I thought as I sat in that charming little restaurant all by myself. I took preference to a glass of white wine this time, desperately hoping that its superior bitterness of taste would resuscitate my fading will to behold my own reflection on the restaurant’s large window.